When comic-book artist Travis (Adam Boys), author of the grotesque sensation Vulgarian Invasions, winds up insulting some local Triads, they cut off his hand and his career is dead. Or so it seems, because the hand re-animates – apparently as a result of being unknowingly puked on by Travis himself – and returns, badgering Travis into being less of a self-pitying loser and more of a freedom-of-speech champion. Yes, for all that it might try to continually outdo itself on the gross-out humour, this a political picture, made hilariously obvious when the Triad boss delivers this subtlety-out-the-window speech: “You thought you were insulting me with your little pictures, but in fact you were insulting something much, much greater,” as he waves around a wad of cash, “the profit. You must never stand in the way of the profit.” Oh, says the audience, now I get it! But plainly, those looking for subtlety have picked up the wrong film to begin with. Actually I found its good-natured, almost naïve readiness to stand up for what’s right really endearing, because there are a lot of these films around: exploitation comedies so bloody they usually get sorted under “horror”, the likes of Planet Terror, Machete, Deathgasm, and most of them don’t do much to earn their audiences. 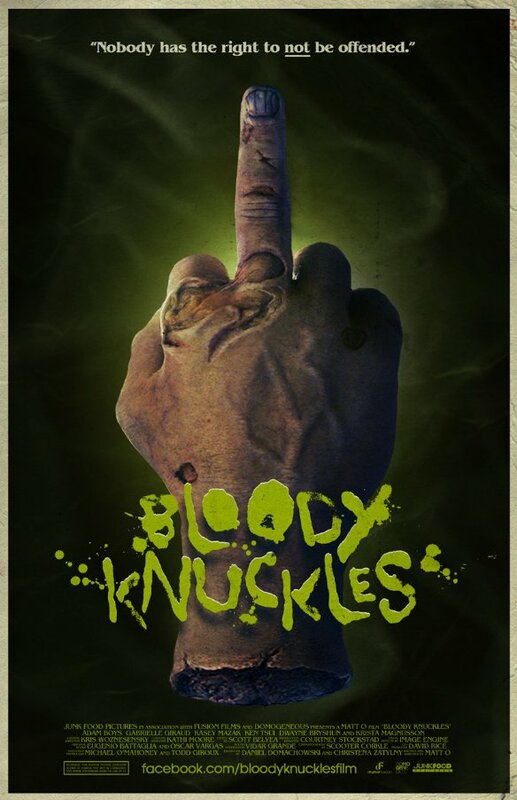 They tend to assume they deserve attention by virtue of being goofily violent, and where shlocky splatter is very easy to get desensitized to, Bloody Knuckles outdoes its competition by being smarter, not grosser, than they are – though it’s still pretty gross. So while it’s unlikely to be the statement piece that emboldens obscene cartoonists to pursue absolute free speech for ever more (man on TV: “freedom of speech doesn’t mean you can say whatever you want!”), it’s a film that gets a lot more right than it gets wrong, and which, unlike so many of the “outrageous” bloody comedies it resembles, might actually appeal to audiences outside of the diehard gorehound crowd. Bloody Knuckles comes to Blu-ray, DVD and VOD from today (27/10/15)! Will you be checking it out? Let us know in the comment box below!